Established in 2000, The RH Community Dancers is a constant, ever changing group of community participants that comes together to learn about their bodies and how they move – and to dance! They are united by a shared fearlessness and playfulness when it comes to exploring the body, mind and emotion through dance. Over the years they have worked with dance artists in diverse practices including contemporary dance, clowning, aerial dance and flamenco. Artists who have worked with this group include Barbara Bourget, Rosario Ensor, Jai Govinda, Karen Jamieson, Julie Lebel, Donna Redlick, Alvin Tolentino and many others. 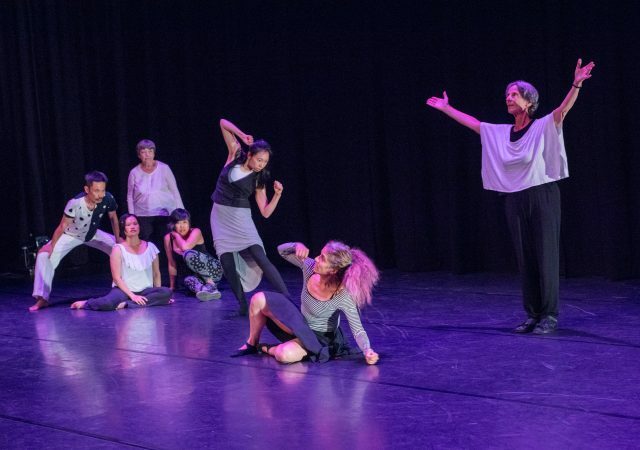 From 2018-2020, the Roundhouse Community Dancers are working with artist Kelly McInnes. Kelly McInnes is privileged to be a settler based on the unceded Coast Salish lands and waters of the Musqueam, Squamish and Tsleil-Waututh First Nations. Kelly dances with the intention of healing, working as a choreographer, performer and facilitator. A graduate of Modus Operandi, Kelly has also trained extensively in contact improvisation at EDAM Dance and in somatic practices with Helen Walkley. Often multi-disciplinary and site specific, Kelly’s work explores the socio-political and invites an attention to sensation. She investigates pleasure as resistance, ritual, voyuerism, body image, gaze and our bodies’ connection to the earth. Kelly’s choreographic work has been presented throughout B.C., in Toronto and in Mexico. Kelly has interpreted projects for EDAM Dance, MACHiNENOiSY, Restless Productions, Out Innerspace Dance Theatre, 605 collective, LINK Dance, Metal Dog, Chick Snipper, Anne Cooper, Daina Ashbee, Sammy Chien, Jacinte Armstrong & Ashley Whitehead. Community-engagement is an important part of her practice. For the past two seasons, she has co-facilitated MINE Youth Project, a collaborative creation workshop & process for youth, with Rianne Svlenis. This fall, she begins a new youth project with artists Sophia Wolfe and Laura Avery. Kelly is a member of the collective Pressed Paradise, which focuses on activating public and unconventional spaces with performance. She is also a member of Mutual Futures collective with a focus on the practice and performance of improvisation.